Though described as an MMORTS, Shattered Galaxy's gameplay is closer in flavor to a real-time tactics game. Instead of commanding an entire war machine, including infrastructure, supplies, resources and objectives, players are given control of a small squad of units (6 to 12), which they control alongside as many as 20+ teammates, each with similar squads, and against similar opposition. Likewise, battles do not center around the destruction of the opponent's base, but rather around Points of Contention, of which there may be anywhere from one to five. These "POCs" are reddish circles on the ground which must be seized by occupying them for a certain period of time (generally 1 minute and 30 seconds). In some battlefields if the attacking side ever controls all of them, they immediately win; alternately, other battlefields employ a ticket system whereby the number of POCs you own over the enemy as well as the number of troops you kill dictates how fast their tickets go down with an immediate win when the enemies tickets are brought to 0. In both types of battlefields, when the game's built-in 15-minute battle timer runs out, the side with the majority of POCs is declared the winner. 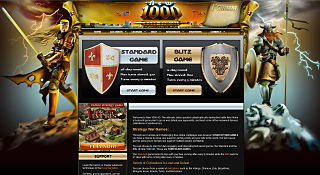 As of April 16th, 2007, the game can be played using a basic account at no charge with a few minor handicaps or upgraded to an elite account at a cost of $9.95 USD per month to play with all limitations removed. We take pride in our high-quality game concept and our attention to realistic details. 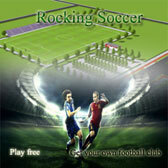 We are also the only online soccer manager with a 2D live match engine where you can see your players move. Will your tactics lead to victory or defeat? It is a free multiplayer turn based strategy war game based on medieval civilizations from around the year 1000 AD. Build an empire using wood, gold, iron and other resources. The goal of the game is to rewrite history and become the greatest civilization in the known world of 1000 AD. Real-time strategy game LINE LITTLE KNIGHTS has come to LINE! * A strategy game that everyone can enjoy! * Become a member of the Order of the Moon, take on the evil overlord Antone, and restore peace to the world! Summon units with a single touch! Support their attacks with magic! Take out lots of enemies at once with Oracles! Knights, archers, magicians...have fun combining different types of unit in a tactical way!